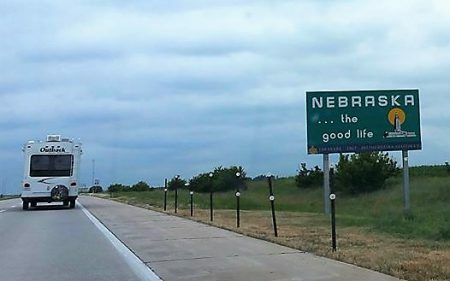 Yesterday, our “home on the roam” left Kansas and moved to another state. We enjoyed our 10 days in the Sunflower/Wheat State. Unfortunately, “life” happened, and we did not get to explore as fully as we’d hoped during our last few days there. With rain in the forecast for this past Wednesday, I suggested that we visit Tallgrass Prairie National Preserve on Tuesday afternoon before having dinner with one of Jim’s work friends instead. It didn’t quite go the way expected. First, we learned that we could not take Chewie on the one trail we wanted to hike, and with the heat of that day, none of us were excited about hiking the trails that were dog friendly. There was a plan B. I’d read that there was a driving cell phone tour, but the disappointment was that the driving tour does not go through, or even around, the preserve. It is a driving tour of the general area. We still were pumped to do that, and it was enjoyable until we encountered long delays due to road construction, gravel roads that slowed us to a crawl (though not bad in terms of making us take more time to view what was around us – we just had a time limit), and then we ran out of time and had trouble finding the quickest way back to the campground. Another disappointment was that I did not see that the park offered a ranger-guided bus tour of the preserve. Had I known that, we’d have left Chewie in the cool of the RV and we’d have planned to take the bus tour. I really, really wanted to see the heart of the tallgrass and the bison in the preserve. As it was, we enjoyed the drive and saw horses, cattle, and goats along with the flora and fauna of the grasslands and farms (I can’t believe we didn’t have a photo of cattle after seeing tons of them; I borrowed a photo). As we left, the plan was for me to come back on Friday to take the bus tour, even though it was a 2-hour round trip to the preserve. 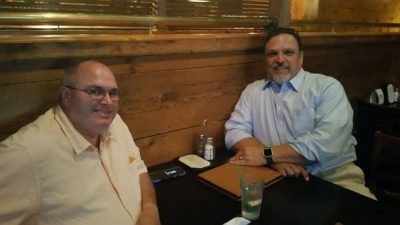 The next day, Wednesday, we were going to Larned and Mushroom Rock, and Thursday, Jim had a midday conference call with the hospital in Montana. The forecast didn’t bring as much rain as it looked like it would on Wednesday or Thursday. In the scheme of things, weather wasn’t the cause of missed opportunities; it was electronic issues that put our play on hold. Tuesday night, after dinner with Jim’s friend David, I sat up later than usual as we had eaten late. As I attempted to turn off my computer, it showed there was an update to install, so I clicked update and shut down and went to bed. The next morning, my computer would not boot up. I blamed it on the fact that I left it to update without plugging it in. I assumed that the battery died before it finished the update, I’d need help getting it going because the usual “take the battery out” routine did not work. The closest Best Buy was about 30 miles south in Wichita, so guess where we went on Wednesday instead of Larned/Fort Larned? Yep, Jim and I went to Wichita. I learned that in the past three months, Best Buy’s Geek Squad has gone to requiring appointments. Lucky for us, there was an open slot 35 minutes after our arrival. We’d not had breakfast, so we went to a nearby restaurant to have a quick, early lunch. Back at Best Buy, we learned that Windows was damaged, so guess who bought a new computer and had files transferred. I’d not thought to bring my external hard drive with us; I didn’t think the situation was that bad. In terms of cost, there was only going to be about a hundred dollars difference between repairing my old one (over two years old) and getting a new one. As it turns out, that was a good decision. Jim and I ran a couple of other errands while the data was transferred, and we got a call from the tech. In the transfer, it became apparent that my hard drive was failing, so it was just as well that we bought me a new laptop. Failing hard drives take longer to transfer; we would have to come back on Thursday to get the new computer. Thursday, we did things around the RV until after Jim had completed his work call, and then we picked up the new computer, making another trip to Wichita. I’m sure you know how time consuming it is to re-establish a new computer to your preferred settings, add in other software, etc. That is what I did the rest of the day. After all of the running and issues related to the computer and Jim’s new phone, which was one of our other Wichita errands, and with the heat of the end of the week, I just didn’t have the energy to make the long drive alone back to Tallgrass Prairie. Jim and I spent Friday relaxing and prepping to move. It was a nice day to enjoy watching farmers harvesting the winter wheat and hay in the area, and we took Chewie to a fantastic dog park I had found that morning when looking for a grocery store. I’m not sorry of my decision to stay with Jim on Friday, but I hope one day to get to visit that national preserve again. Some funny things happened in our preparations to leave Cottonwood Grove Campground. 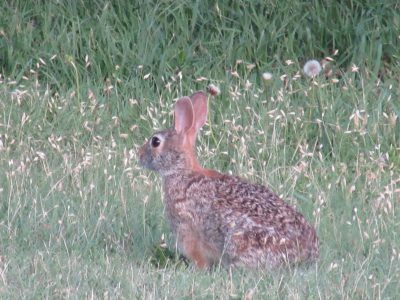 Friday night, as we walked around making pictures of the campground, the elusive bunnies decided to pose for photos. As we were hooked up and ready to roll Saturday morning early, I stopped by the campground’s bathroom to wash my hands, as is usual. When I opened the door, I was surprised to see a baby skunk. Startled and frightened, s/he ran behind the trash can. I grabbed a nearby chair, propped open the door (so s/he could get out or Momma skunk could come find the baby later), and then went to get my phone to attempt a photo. 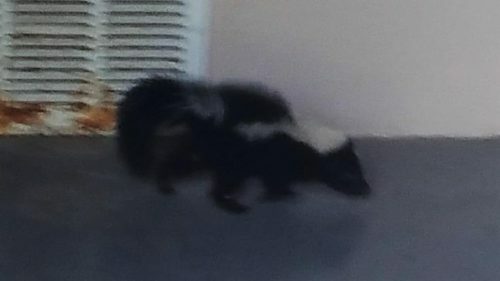 The picture is blurred because the skunk was moving, and I didn’t take time to focus for fear of missing him/her altogether. I went into the men’s room to wash my hands. As I drove along, I wondered how s/he got in there. A couple of days before, we’d had a family of 5 tent camping, and since 4 were female, they pretty much kept the bathroom door open. I fear that when they left, the little skunk unknowingly got shut in. I truly hope the baby and his/her Momma have been reunited, and I am thankful it was not Momma skunk who was there when I opened the door. She may have sprayed first and asked questions later. Yesterday, Jim, Chewie, and I swapped the fields of hay being bailed and winter wheat being harvested for field after field of corn growing in Nebraska, and that is our new adventure in our home on the roam.